I’ve always been utterly compelled to buy books with titles like, ‘A Monk’s Way to a Clean House and Mind‘, not because I believe I’m particularly foul of mind or dirty of home, but rather because they call to a deeply sought desire for calm and order, essentially my wish for a head untroubled by any form of to-do list induced stress. Yeah, good luck with that, I can hear you saying, nay sighing. 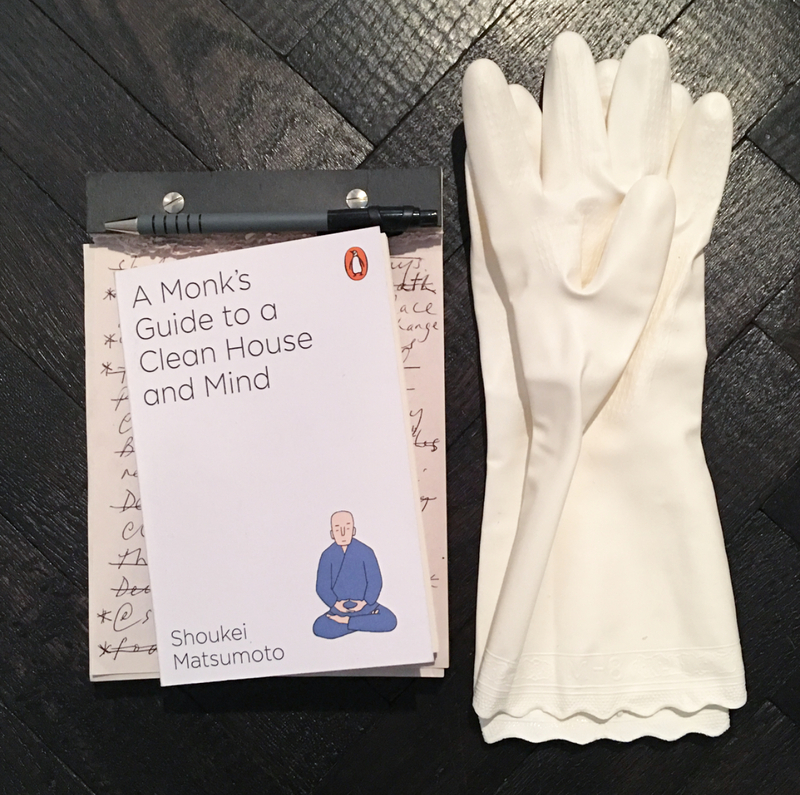 ‘A Monk’s Guide to a Clean House and Mind” by Shoukei Matsumoto, Penguin £4.99 And my floor (dark-stained oak from Ecora), freshly-oiled! It’s the same compulsion that sees me seduced by beauty products which employ phrases like ‘glow-inducing’, ‘radiance-making’ or ‘perfecting’ in their spiels, throw in a fancy box and I’m sold. Except modern life, a nearly four-year old, two dogs and doing it all solo, doesn’t particularly engender either a non-multi-tasking agenda or a complexion which ‘glows-from-within’. 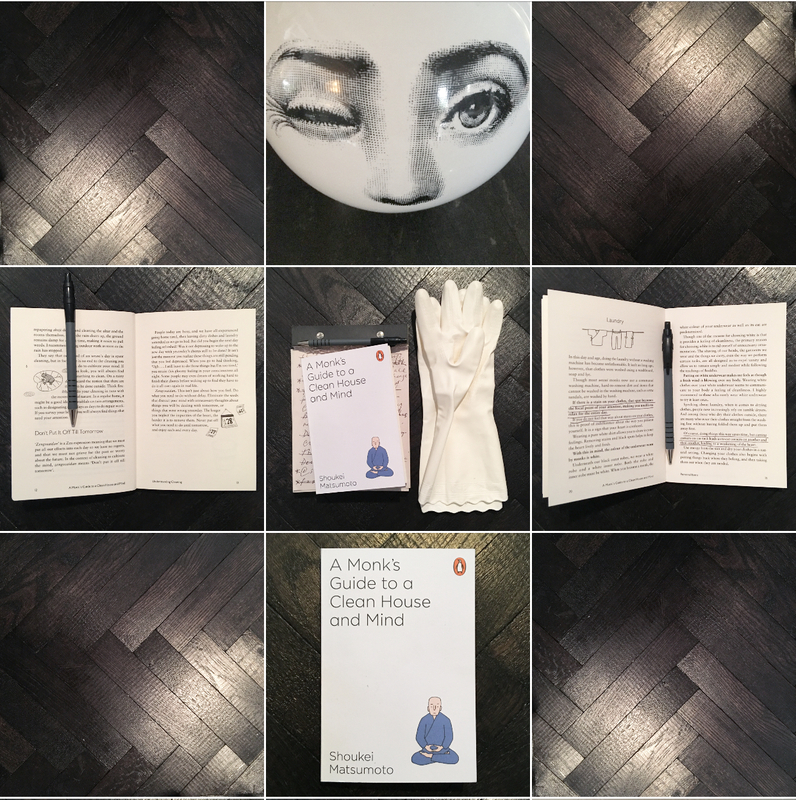 Hence being the perfect target market for books about ways to be more Zen, not to forget expensive serums. And so, I decided to try to follow the Buddhist’s way for a week and see if any of it made sense for a non-monk with a mortgage. It also details how to clean and repaper Shoji doors, the idea of the Butsuma (a sort of home-altar which must be kept spotlessly clean and clear of clutter), the concept of refreshing ones clothes each season by switching from summer weight to winter, and vice versa, on the 1st of June and October, and the importance of dealing with stains… “If there is a stain on your clothes, that spot becomes the focal point of your attention, making you unable to relax for the entire day. If you do not feel this way about stains on your clothes, this is proof of indifference about the way you present yourself. It is a sign that your heart is confused.” Ouch. Monday: I start with great zeal, flinging open windows (number one instruction prior to cleaning any room) and sweeping the floor of my home office, much to the horror of the dogs who also sleep there. To be honest I generally do this any day I’m home writing, as I can’t bear to work surrounded by a fine layer of dog-dust. However, this morning, I shoo the boys into the front garden, stick their cushions into the washing machine, then sweep, brush, mop and dry. I dust the shelves, clean my desk, then shut the window because not only is it freezing, but I realise it’s raining. Meanwhile small is clamouring for his breakfast, my stomach is rumbling and I realise we’re now going to be really quite late to get to nursery. I congratulate myself a little for being ‘in the flow’, absorbed as I was in my task. Yes, I can do this, I think. I even consider re-oiling the floor boards, it now looks so pristine. Then I let the dogs in. Let’s just say, dogs + rain + digging + pawprints. I walk away to make breakfast. As we eat, I’m mildly distracted by ‘the flow’ of Oatabix onto the floor. Nevertheless, I whip out kitchen roll, scoop, clean, stack bowls straight into the dishwasher, wipe out the sink, and harness up big hound (smaller hound has buggered his back so is temporarily on ‘cushion-rest’) and out we go. I drop small at nursery, do a ‘contemplative’ circuit around the park with the one hound, before taking the long loop home where I hook his lead over the gate post so I can fetch bucket and soap to wash his paws before letting him inside. Luckily, Basset Hounds are terribly obliging of such indignities, so I end up vigorously brushing and washing them both. Hmmm, if I could get into grooming them everyday, then perhaps there wouldn’t be so much dog hair to sweep up of a morning? Then again, it is only 10am and I’m already exhausted. My office has now been re-mopped, the dirty bucket, mop etc are polluting the kitchen, along with a ridiculous amount of hound hair from the dog beds which are now whirring around in the dryer. Meanwhile the Bassets sit mournfully on their squeaky clean floor. They smell nice though. And I’m wondering how I’m supposed to keep ‘my temple’ clean when the weather report indicates rain for the next few days. 9pm: In a fit of utter monk madness I am on my hands and knees re-oiling the hallway, as I figure it can do its 12-hour drying time overnight! I clean first, musing that the left-hand, right-hand, rag cloth routine has a sort of meditative quality to it, and once I begin with the oil, there’s no doubt that freshly glossy parquet is a thing of great beauty. I work backwards until I’m at the foot of the stairs, let the dogs out for a wee, kettling them straight in/out the front door (my office is just to the right), shut them in for the night (a baby stair gate across the doorway), then oil myself to the bottom of the stairs, perching precariously, tin in hand, on the last step to finish. I realise, too late, that I’ve left all the kitchen lights on, and I’m now mildly concerned that the oil is emiting semi-toxic odours. I decide I don’t care, snap the lid on and go to bed. I ache from head to foot. Tuesday. I do not want to clean. However, the hall looks ridiculously wonderful so I block it off so no-one can walk down it (it’s possible after all to walk through the lounge to get to the kitchen). I lay newspaper over the portion adjacent to the front door, and let the dogs out, trying in vain to hold down the paper in the face of what appears to be a minor hurricane outside. I’m pleased to see there’s a lot less hair etc in my study. All that cleaning and grooming definitely made a difference! I wonder if that means I can skip it all today? Then I let the dogs back in. A dark cloud descends. I do not feel remotely Zen, I feel decidedly grumpy that there are now wet doggy paw prints front, right and centre. I consider laying newspaper everywhere, and recognise there is a reason monks do not, to the best of my knowledge, have hounds. Meanwhile, small wants to know why I’m hoovering in the morning. Because it’s quicker than sweeping, I say. I am a touch stressy as all of yesterday’s cleaning plus post-polishing recuperation, meant I didn’t get a whole lot of other stuff done. I wonder if I could just hoover the dogs and cut out the middle man. I decide it’s probably not ethical, but add ‘look up vacuum dog grooming devices’ to the increasingly lengthening to-do list. Later I cheerfully distract myself on Instagram, to discover that someone has given Kelly Hoppen a pair of white washing up gloves. These. I. Must. Have! Delighted to discover they’re stocked in Lakeland, £3.69 for a pair. I immediately order three pairs, to be express delivered. After all, even though I know there’s a sizeable bricks and mortar branch 10 mins away, its still raining and I now don’t want any unnecessary mess in the house. I also google Japanese cleaning brushes, sweater de-bobblers, baking soda, and linen tea-towels. Wednesday. Study floor once more obliterated by dog hair. Small wants to know when he’s allowed to use the hallway again, and I have this morning already used an old toothbrush to clean a jug, bleached the sink, polished my version of a Butsuma (a wall-hung unit placed at the end of the hall facing the front door on which sit various lovely items of personal significance), ordered some picture frames from The White Company, put a pair of curtains in the wash, and made a ‘charity pile’ of clothes I’ve decided I won’t ever wear again. My white washing up gloves arrive. These make me insanely happy. I literally love them. Of course I’ve kept my old yellow ones for doing messy things, like the now daily washing of the dogs’ paws. Thursday: I do not clean before I take small to nursery. I don’t want to get up any earlier than I already do (7.30am), and it increasingly feels insane to be spending my morning mummy-and-son time trying to talk to him over the din of the hoover. Instead, I start once I’m back, post the walking (and now cleaning) of the one hound. And because it’s sunny today, I clean the porch, front path, and gate and weed all around the steps to the pavement. I finish by sloshing an indecent amount of Zoflora-ed hot water over the whole lot. Ahh, so fragrant now is the path direct from pavement to ‘Butsuma‘, that’s got to be extra good, right? I also pick all the leaves off the grass and ‘marvel’ at the huge hole that big hound seems to have dug in the flowerbed, mentally adding ‘research picket fences’ to ‘the list’. Friday: Pyjama day as no nursery for small. I was too tired to write notes, I didn’t even want to wash my face, so I’ve no idea what I cleaned today, if anything. Saturday: Study. Hall. Butsuma. Raining. Newspaper in hall. Massive pile of stuff on table to eBay. Then took delivery of some glorious lilacs so enjoyed myself a lot more by photographing flowers all morning. No more cleaning. I’ve often written about the importance of regular home maintenance, in that most of us probably service our cars more frequently than we even think about checking the roof, and yet we expect our homes to consistently shelter and protect us. Little and often is definitely a key mantra in this respect — catch things before they have a chance to become major issues. And certainly it would be wonderful to think of our homes as our domestic temples, and to honour and respect them with dedicated daily care. However, unless you wish to become an insanely irritating, and overly precious nutcase, who’s constantly with DustBuster and J-cloth in hand, I can’t really see how much of Matsumoto’s writing can reasonably be expected to be absorbed into everyday non-Monkish life. That said, I don’t believe it was his intention for us to follow his words like a prescriptive scripture. And certainly by the end of the week, I’d picked up some pace, and each ‘task’ I set myself seemed easier. I’m also in the midst of the annual household detox so this book was a timely read (Separate post to come on the purge potential of renewing your home insurance!). However, as the week wore on, it wasn’t so much that I ran out of enthusiasm, as life crept back in. I simply had too many other things to do. And this despite now working from home, and being comparatively ‘unbusy’ for the first time in forever! Also, it seemed the more I looked, the more things I could find to do… replace cooker hood filter, re-pot plants, get electrician in to fix broken socket etc. I love my home, and I want to take care of it, but I also love it’s capacity to be a messy hub of activity, as well as a place of respite. I do not want to live in some sort of perfecting project — not really the point of ‘home’ to me. But then I have been a bit lax on the life admin front of late, and the last year has seen a constant stream of builders in and out fixing and finishing what’s been a very drawn-out renovation project, so admittedly there’s a lot of catching up to do! However, I wonder if there’s ever a moment when any to-do list is actually completed? It’s as if the sheer act of recording to-dos creates some sort of ever unfulfilled prophecy?? PPS Two weeks on I added an addendum to this post. I do agree that it’s a constant battle with no end in sight… there will always be something … three boys, dog.. old house… I think perfection can be quite enslaving. I belief in putting the effort in but also in accepting limitations!! You’re quite, completely, absolutely right! It’s a lovely ‘ideal’ but not one to strive for. Perfectly put, I like that… perfection is definitely not an honourable pursuit. I’ve always believed that to be called a perfectionist is NOT a compliment. But putting in the effort, for the pleasure of doing so, THAT can be enjoyable. You make a good point. It’s all upto the individual. We must know ourselves. I suspect you are probably a lot more naturally chilled than I am! Regrettably, I can’t rest unless I’ve tidied everything away first. I LOVE the mess of kids and stuff, but I can’t do dirt… I absolutely have to clean my study (vacuum/mop floor/wipe down tabletop) aka the dog’s bedroom (they seem to leave a fine layer of brown dust/dirt on EVERYTHING?! ), before I can start work, and everything has to be put away before I can go to bed. Sigh. Hee, hee, hee! Yep, there’s definitely a fine line between ‘cleaning’ as meditative pursuit and ‘cleaning’ as cleaning.